In this tutorial, you will learn to use continue to skip the current iteration of a loop. Also, you will also learn about continue labels in this article. Suppose you are working with loops. It is sometimes desirable to skip the current iteration of the loop. In such case, continue is used. The continue construct skips the current iteration of the enclosing loop, and the control of the program jumps to the end of the loop body. 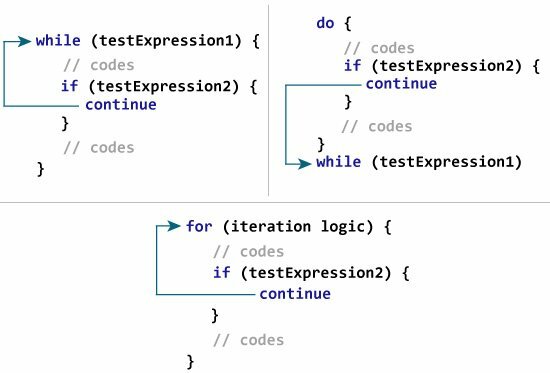 If the testExpression2 is evaluated to true, continue is executed which skips all the codes inside while loop after it for that iteration. is executed in each iteration of the loop because this statement exists before the continue construct. The program below calculates the sum of maximum of 6 positive numbers entered by the user. If the user enters negative number or zero, it is skipped from calculation. What you have learned till now is unlabeled form of continue, which skips current iteration of the nearest enclosing loop. continue can also be used to skip the iteration of the desired loop (can be outer loop) by using continue labels. Here, outerloop@ is a label marked at outer while loop. 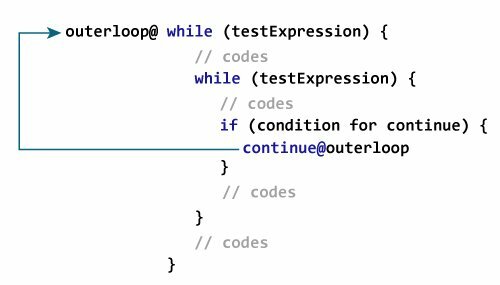 Now, by using continue with the label (continue@outerloop in this case), you can skip the execution of codes of the specific loop for that iteration. The use of labeled continue is often discouraged as it makes your code hard to understand. If you are in a situation where you have to use labeled continue, refactor your code and try to solve it in a different way to make it more readable.